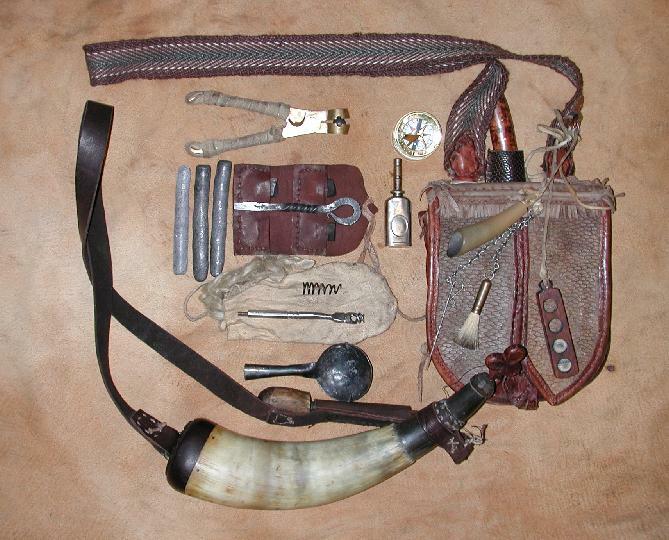 Shooting Bag & Contents and Powder Horn. My rucksack is constructed of 12 oz. hemp canvas. It measures 14"x 19" x 3". The canvas is treated with a mixture of burnt umber paint powder and linseed oil. This mixture was worked well into the canvas and took about two weeks to dry. The bag is now impervious to water. The bottom is reinforced with leather wrapping up the front and back. The straps are reinforced with copper rivets. Presently there are two brass rings attached to the bottom of the bag for carrying blankets, but I don't like this approach and will be removing them. They allow the bedroll to swing to much. Pictured here are some of the foodstuffs that.are always in my rucksack. In the lower left corner is a pile of pieces of portable soup, which is basically boullion rendered down from beef roasts or the leftover Thanksgiving turkey. Moving clockwise is a sample of ground blue mexican corn. Next is a conglomeration of jerky. This is quite dry, but reconstitutes easily. Below the jerky is a bag of steel cut oats. Boiled oats with raisins or cranberries makes a fine breakfast. To the left of the oats is a piece of bacon. I've carried some pieces of bacon for more than a year and still was able to use it. Left of the bacon is a small salt horn. In the center are two cones of muscavado sugar, a cake of maple sugar and some mexican chocolate. This is not all I usually carry with me. I also enjoy split peas, corn cakes, fresher jerky, an occasional apple, parched corn kernals with walnuts and maple sugar mixed in to name a few. When it comes time to cook, I use a tin boiler or small sheet steel fry pan. The tin plate.is quite light and very convenient for preparing other foods. I use a long handled silver spoon and a wooden spoon. If I am lucky enough to have some fresh meat, it usually gets roasted on a green willow over the coals. Seems like there is always something to repair. Here are the items I carry in my sewing kit. A small pair of scissors, a woden needle case with various needles, a wooden boobin filled with light linen thread, a roll of brown waxed linen 6 ply thread, a small awl carried stuck into a lump of beeswax, a bundle of rawhide lacing and some leather scrap. It's good to practice some hygiene on the trail. Here is the ubiquitous bone-handled, boar-bristled tooth brush, some castlie soap, a small mirror and a horn comb. Also pictured is a turkey bone which may be used to blow on the tinder bundle when lighting a fire, or to practice making turkey calls. That's the basics of what's in my pack. The themes seem to be fairly common among re-enactors with variances in the details. Something I didn't show here is the Pur water filter I carry. A good friend and trekker Kent Klein carries a small medical pouch marked with a red cross. I like that idea and will incorporate it in my bag to carry my insulin supplies.